The staff of ELETTRONICA CAVALLO, a company that has been operating in the sector of heat formed wood for 40 years, is made up of technicians of with wide and various experience in the application of high frequency in woodworking, bending and forming machinery. All the generators are constructed in different ways, according to the requirements of different workings and those of each single Client. A constant keeping up-to-date in the use of the most sophisticated technologies, the use of the most recent materials and a "handicraft" precision in constructing our generators: these are the best guarantees of wood-bending machinery quality we can offer our Clients in full confidence. With a company like Elettronica Cavallo the numbers speak for themselves. 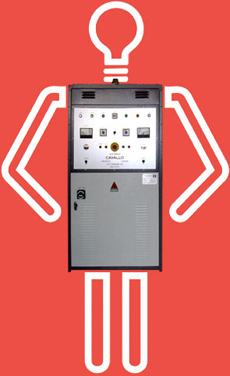 The company has installed about 2500 high frequency generators, for various applications, throughout the world. A record that our clients, with unceasing demonstrations of confidence, spur us continually to outdo.